As an organization we are entering one of the most exciting and challenging points of our company’s history. Our growth over the past few years has been substantial, as we have added several facilities and over 1,000 new jobs to our nation’s economy. Along with our growth comes opportunity. In support of our company’s growth, core values, Vision and Mission, NYX is committed to recruiting only the most talented and qualified people. We are enthusiastic about the energy and imagination that new talent will bring to our organization. Our new additions will further strengthen our World Class workforce – a dedicated team energized by the collective creativity of a diverse talent pool. The spirit of Innovation, entrepreneurship and cultural harmony permeates at all levels and across all value streams at NYX. The essence of this spirit is a passion for enhanced value to our customers and continuous growth opportunities for our employees. 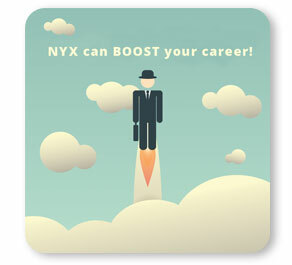 At NYX we offer more than just jobs, we offer careers. When you work at NYX, you work with a team that thrives on ‘vertical learning’. In the past year more than 90% of our job openings have been filled through internal promotions. Our internal promotion rate is the product of NYX’s wide range of development programs, including education benefits and advanced development training.